Ok, I have a confession. I LOVE scaring the crap out of little kids 😈! But not the kind of scare that *really* scares them and can make them cry, but the kind of scare that just startles them and may make them jump, but is followed by lots of giggles. So, it should be no suprise that I love reading spooky, "scary", and suspenseful stories, and that Halloween is one of my favorite storytime themes. Knock on wood, I have never made a child cry, so I think I'm pretty good at adjusting the fright level for the age and sensitivity of any given group and knowing when to tone it down and when I can go all out. Snappy Little Halloween by Dugald Steer & Derek Matthews is a good all-around book that works with a range of ages. First of all, it has pop-ups! Then it shows a good variety of Halloween icons: witch, black cat, ghosts, skeletons, bats, monsters, and a smiling jack o'lantern, but they are presented in a very non-scary way, with bright colors, cartoonish illustrations, and most are smiling. But, those who enjoy a fright will have fun pretending to be scared and squealing each time a new monster pops out at them. I have to mention The Hallo-Wiener by Dav Pilkey because not only is it my boss's favorite, it was also my daughter's favorite. This is a really good one for a family storytime that has parents and older siblings who will get and appreciate all the puns and jokes, like "feeling frank", "hero sandwich", etc. Younger kids won't get all the jokes, but they still seem to like it, and it's a good opportunity to talk about how it's not nice to tease someone. Big Pumpkin by Erika Silverman & S. D. Schindler is another classic that is also a favorite of one of our volunteers. This can be made very interactive, with the kids identifiying each creature/monster that comes along, joining in with the many repeated lines, and predicting whether each one will be able to pick the pumpkin or not. And of course there is the added bonus lesson not only in working together and sharing both the work and reward, but a good segue into talking about how pumpkins grow from a seed. It is a bit text-heavy, so you may have to do a little editing and condensing for younger, more wiggly crowds. The Little Old Lady Who Was Not Afraid Of Anything by Linda Williams & Megan Lloyd. I'm sure most of you are already familiar with this book, as it has become a classic and is loved by many. I fell in love with this book the first time I heard my co-worker read it several years ago, and it is one book that I can read over and over, and still not get tired of doing (which says a lot, because I do tend to get bored). 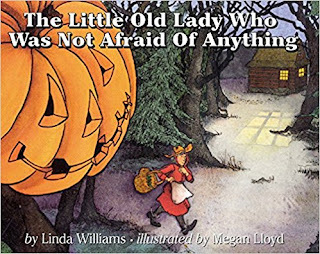 I love this book for so many reasons: the rhythm and cadence, the repetition that encourages audience participation AND incorporates movement, the suspense, the chance to "scare" the audience when the pumpkin head first appears and says "Boo! ", and the happy ending. It is just so much fun to do, and pretty easy to adapt to your audience's sensitivity. Of course I like to really be dramatic and spooky, and build up the suspense, and really startle the kids by yelling "BOO! ", which makes them jump, then dissolve into giggles. But, if I have a younger crowd, or one that I'm unsure of, I can tone it down quite a bit and make it more light-hearted. I really wish I had a Big Book version of it, too. I also like that while it shows a jack o'lantern, it never uses the word "Halloween" or mentions magic, witches, monsters, etc., so it could also be used when it is preferable or necessary to avoid these things and do a more generally spooky/scary storytime (I have a few other books that fill this niche I will talk about next week). I'm sure it's no suprise that this is a favorite theme among children as well. They love talking about trick-or-treating and sharing what costumes they will be wearing, and they love pretending to be scared, and it's my belief that most kids don't get scared that easily, unless they've inadvertently been conditioned to be fearful by being too sheltered and having their fears reinforced rather than being reassured that they don't need to be scared (when there really isn't anything to be scared of). "Scary" books and pretend play are great ways for children to learn how to work through their fears, and learn to distinguish what really is something to be afraid of and what is not. As much as I love these books, they've all been around a while, and it's getting more and more frequent that the children have already heard them at school, daycare, or home, and may even own some of them. So I really need some newer titles to incorporate, and while I've kept an eye out, I just haven't seen anything that really "wow-ed" me. 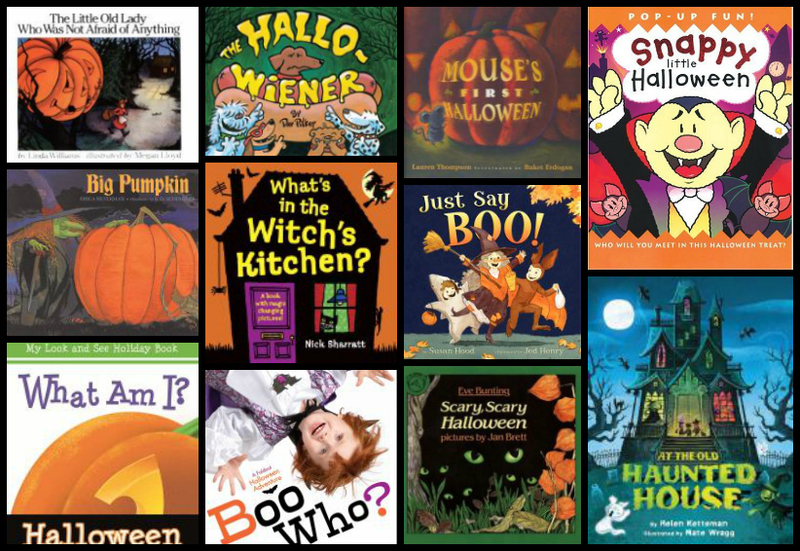 So, any suggestions for other really great Halloween or generally spooky read-alouds that I've overlooked? Or some songs/activities the kids really love? I find I keep doing "Five Little Pumpkins" and "Little Ghost" because the kids really seem to enjoy them, but I'd like to have a little more variety.